Dr. Davidovitch has been committed to advancing anterior approach hip replacement, making it as minimally invasive as possible to accelerate rehabilitation time and decrease the risk of complications like dislocation and leg length discrepancy. He was the first surgeon in New York City to perform the minimally-invasive anterior approach, and has since successfully performed more than 1,000 such procedures, seeing recovery time decrease incrementally—until he achieved the same-day discharge of a patient earlier this year. 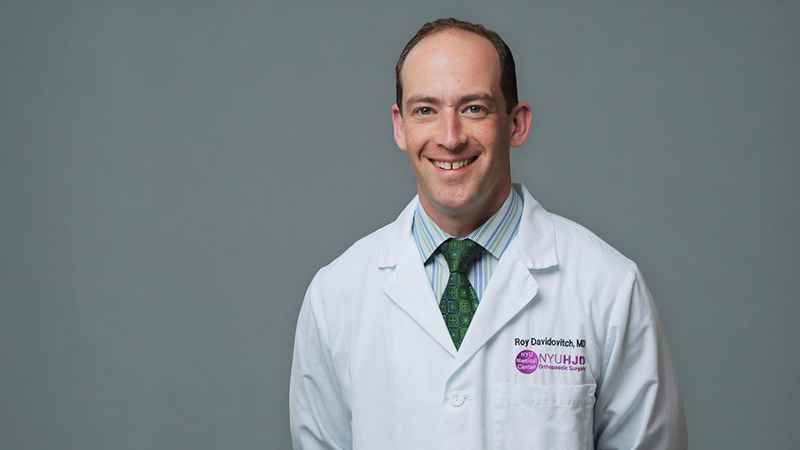 NYU Langone Medical Center last month became the first academic medical center in the New York City area to initiate a same day hip replacement program after successfully discharging a patient the same day of surgery. Traditional hip replacement surgery requires dividing muscles and tendons from the femur bone to surgically access the hip joint and implant the replacement. Post-surgery hospital stays typically range from two to three days—and some patients require further care at a rehabilitation facility following discharge from the hospital. Surgery for patients who meet criteria for same day anterior approach total hip replacement usually is concluded by 9:00AM, giving them sufficient time to recover and mobilize in the hospital before walking out with an assist device by the early afternoon. A visiting nurse and physical therapist visit the patient at home the day after surgery, and intermittently over the following two weeks. Ultimately, the patient can be back to their normal activity level within six weeks. “Dr. Davidovitch’s same day hip replacement exemplifies our mission to bring patients the most recent treatment advances in orthopaedic surgery in an effort to improve their surgery outcomes and satisfaction,” says Joseph Zuckerman, MD, the Walter A.L. Thompson Professor of Orthopedic Surgery and Chair of the Department of Orthopaedic Surgery at NYU Langone Medical Center. Dr. Davidovitch says the best candidates for same day hip replacement surgery are those who do not have cardiac disease and have a strong support network to aid in their at-home recovery.